Lineage allows us to determine the origins and source of teachings. We can find out about the lineage of a practitioner by understanding who their teacher, and their teacher's teacher was. This is what lineage is and it goes beyond organisations. The ancient mystery schools have always put a lot of emphasis on lineage and preserving the knowledge, wisdom and keys to true spiritual power shared. To ensure the energy transmission beyond just the sharing of the knowledge students are thought orally and the transmission was affirmed through initiation. WHAT IS A MYSTERY SCHOOL? AND Why are THEY Such a Mystery? The term of Order of the Quest can be used to define the body of initiates that form a mystery school and are dedicated to better themselves as well as to bring light to their environment for the progression of humanity. Throughout history there have been many periods where the keepers of this knowledge had to operate underground. Their wisdom and light wasn’t always welcome. Over the last 20 years this has started to shift, we are entering a different time where more and more people are openly looking for this ancient wisdom. There are 7 mystery schools on the planet today. A mystery school can be likened to a tree with a strong trunk and several branches. So each mystery school has a foundation in it’s own lineage and has different branches of study or energy work. E.g. Shamanism, Alchemy, Druidism etc. The 7 Mystery Schools are: the Tibetan Mystery School, Japanese Mystery School, the English Mystery School, the North American Mystery School, the Australian Mystery School, the Rumanian Mystery School and The African Mystery School. The schools have different lineages such as origins in Lemuria, Middle Earth, Atlantis and the Gods of Space or The Northern Gods or in the case of the school we study in the Lineage of King Solomon. We are proud to train in the ancient lineage of King Solomon through the Modern Mystery School. The School’s mission is about anchoring more light to the planet and holding the vision for a future where we can all live together in unity, royalty and joy, connected to our divinity and flowing abundance to all people on earth. The lineage of King Solomon can be traced back 3500 years and beyond that with less accuracy back to 8000 years. This is an ancient mystery school lineage which has safeguarded the wisdom and true ways of working with energy for lightwork through thousand of years so that we can use these tools today. King Solomon was a very wise man who gathered shamans from a lot of different places and traditions to work together in a dedicated temple. They exchanged practices and tools and he reorganised the wisdom into a powerful and very wise system of study and spiritual progression which allows us to gradually receive more light through initiation. This is a very safe and tested way of opening our consciousness and senses and to learn how to work with the higher worlds. It is not about showing you the way but about giving you the tools to access your own wisdom and guidance. In that sense by connecting to and living your purpose from a place of empowerment and joy you contribute to the progression of all. Initiates of this lineage including Leonardo Da Vinci, Sir Isaac Newton, Carl Jung and David Bowie, have been working in large and small ways, in the public eye and behind the scenes sharing their light and creative force in their own unique way for the benefit of humanity. Who are the lineage holders today? Ipsissimus Gudni founded the Modern Mystery School when he was allowed to bring this Lineage out to the public in 1997. 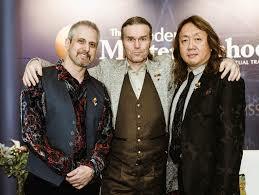 He is called Founder Gudni to honour this event and his efforts to bring these ancient profound teachings to the world. Founder Gudni’s dedication to his mission and to safeguard the lineage is beyond inspiring, he dedicates his life to this mission and lives it with joy and passion in everything he does. You are an eternal being.You have never been born, therefore you can never die. Ipsissimus Dave Lanyon is a true warrior of light, his heart can be felt by everyone who meets him yet he does not let any shadow pass unchecked. Based in Toronto his passion for empowering people leads him to teach people all over the world in the capacity of Ritual Master Teacher and Warrior of Light. Every moment of time we are given the choice between light and dark, positive and negative, good and evil. A Warrior of Light learns to be wise enough to distinguish the difference and recognizing the choice, they choose Light, even though it is often the harder of the two. Our ultimate weapon is Love, our shield is Peace, our fuel is Passion and our goal is Joy. It is easy to be calm when you are meditating. It is easy to visualize when you meditate sitting still. It is easy to think positive while in a temple.Can you be calm, positive and have clear vision while you are moving through life? The universal life force has to be controlled both inside and outside of you; with this you can have full control over your inner and outer universe. The The Council of 12 represents the council of the 12 Goddesses. It the frequency of the divine feminine for the lineage. These 12 powerful goddesses are also involved in the day to day running of the school.